Sean has been in sales almost all his business life. For the last five years, he has been selling credit card merchant services. 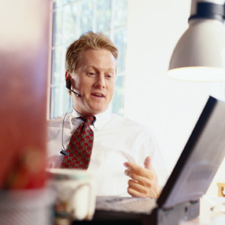 Recent trends in technology mean that Sean now has the option to work from his home. He also manages 28 other salesmen working for the same company in eight states who report directly to him. Each of Sean's 28 salesmen also works from their home. Sean’s company uses the Universal Office to manage their sales force and provide a uniform, professional for their company regardless of where the call comes from or to whom it goes. "Communicating, both with prospects and my group of salesman, became a huge issue in conducting business for me. It's especially challenging because we all work out of our homes or even our cars when we're on the road. I needed a way to accept and distribute information on the fly and still be able to separate the important calls from the less important calls.” says Sean. His company adopted the Universal Office as the system that incorporates everything they need into one communications solution. "The communication stuff we knew we needed, and Genie handles that just great. There's call screening, message handling, call routing, stuff for different times and different days, AudioGrams and Fax-O-Grams and what not. And I couldn't live with conference calls. But that turned out to only be a part of the puzzle. Where Genie took us even before we understood that we needed to be there was in handling our day to day money, especially commissions and expenses. "Let's face it; my 28 salesmen aren't in this for their health. They do what they do for the loot: the sheckles, dinero, gelt, francs, marks, kroner - M. O. N. E Y. And the faster we can close, deliver and bill out and the faster they can get paid, the happier they are and the more they sell. That makes me happy and it makes my boss happy and it makes the customers happy. "With our Universal office, we also got the Virtual Merchant and GenieCards for everyone. Now, when one of my guys closes a sale he can enter it right over the phone wherever he is, along with the customer's credit card information. That message gets routed right to our shipping department AND our accounting department. The product goes out the door faster than ever, and the sale gets booked in record time. Within a couple of days everything has been cleared, the product is in the customer's hands and the sales rep's commission is in his or her GenieCard account. You should have heard the lilt in Jean's voice the first time she got her cut of a sale within days instead of weeks like it used to be. I just knew she was going out to close more sales as soon as we finished talking. "It's the same with expenses, too. We don't cut a single expense check anymore. Edgar, our last holdout, made the switch a couple of weeks ago, when it finally dawned on him that he was just wasting time and losing value by waiting for that old paper check in the mail. Everyone just emails their expense statement in to the accounting department, along with scans of their receipts. Then in a day or so they get a transfer to their GenieCard. They do still have to mail in the originals of their receipts, but that's only so we can keep them on file for the 19th Century folks who work for Uncle Sam. Nobody waits for the stuff anymore. "If I had the Universal Office five years ago, I might have more time for tennis instead of logging those boring highway miles! My Universal Office streamlines, and automates my workday letting me concentrate more on closing the sale. That's what I do best!" says Sean.